The soap-box speakers in the Domain provided public entertainment and egalitarian opinion for those who heckled or agreed as they strolled by. Janet, her sister and mother shared a two-bedroom sandstone terrace with a lean-to kitchen and outdoor toilet on the corner of Corfu Street and Talbot Place, Woolloomooloo, where the Mathew Talbot Hostel now stands. 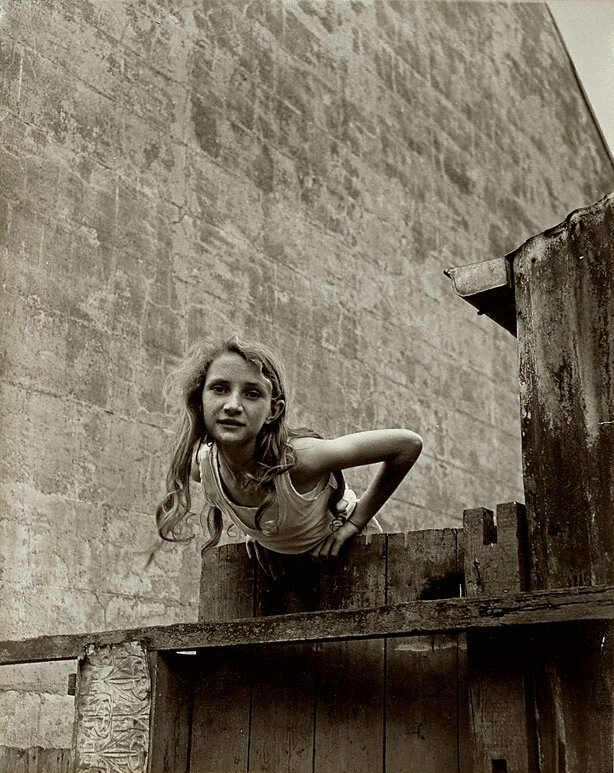 This timeless portrait connects the subject with the photographer ‘presenting some of the feeling of reality’ to the image in keeping with the ideas at the time about photojournalism or the story essay.2 The towering, stark stone wall of the neighbouring terrace rising above the young figure hanging over her broken wooden fence intensifies human connection to place through its contrasting surfaces. Woolloomooloo was a working-class inner-city suburb of Sydney – finger wharves jutting into the harbour, ships, immigrants, imports, exports, prostitution and pubs – a vibrant centre of contact for working women, sailors, stevedores and observers.